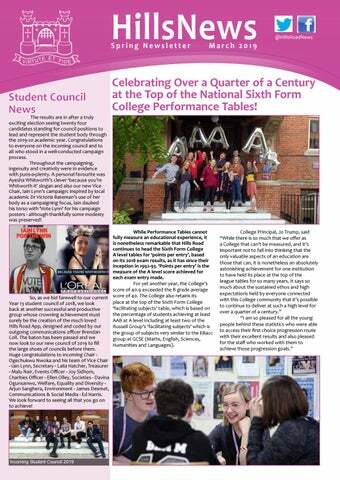 Celebrating Over a Quarter of a Century at the Top of the National Sixth Form College Performance Tables! The results are in after a truly exciting election seeing twenty four candidates standing for council positions to lead and represent the student body through the 2019-20 academic year. Congratulations to everyone on the incoming council and to all who stood in a well-conducted campaign process. Throughout the campaigning, ingenuity and creativity were in evidence with puns-a-plenty. A personal favourite was Ayesha Whitworth’s clever ‘because you’re Whitworth it’ slogan and also our new Vice Chair, Iain Lynn’s campaign: inspired by local academic Dr Victoria Bateman’s use of her body as a campaigning focus, Iain daubed his torso with ‘Vote Lynn‘ for his campaign posters - although thankfully some modesty was preserved! While Performance Tables cannot fully measure an educational experience, it is nonetheless remarkable that Hills Road continues to head the Sixth Form College A level tables for ‘points per entry’, based on its 2018 exam results, as it has since their inception in 1992-93. ‘Points per entry’ is the measure of the A level score achieved for each exam entry made. For yet another year, the College’s score of 40.9 exceeded the B grade average So, as we bid farewell to our current score of 40. The College also retains its place at the top of the Sixth Form College Year 13 student council of 2018, we look ‘facilitating subjects’ table, which is based on back at another successful and productive the percentage of students achieving at least group whose crowning achievement must surely be the creation of the much loved AAB at A level including at least two of the Hills Road App, designed and coded by our Russell Group’s ‘facilitating subjects’ which is outgoing communications officer Brendan the group of subjects very similar to the EBacc Coll. The baton has been passed and we group at GCSE (Maths, English, Sciences, now look to our new council of 2019 to fill Humanities and Languages). the large shoes of councils before them. Huge congratulations to incoming Chair Ogechukwu Nwoka and his team of Vice Chair - Iain Lynn, Secretary - Laila Hatcher, Treasurer - Malu Nair, Events Officer - Joy Sidhom, Charities Officer - Ellen Olley, Societies - Davina Ogunsanwo, Welfare, Equality and Diversity Arjun Sanghera, Environment - James Desmet, Communications & Social Media - Ed Harris. We look forward to seeing all that you go on to achieve! The Politics department has continued the long-standing tradition of a transatlantic field trip with their inaugural visit to New York City. At the end of January, Mr Southeran led the trip and was joined by his colleagues, Mr Roegele, Mr Perkins and Mrs Michell. They accompanied thirty Year 13 students to the ‘Big Apple’, leaving College for London Heathrow before dawn on Monday 28th January. Their packed programme of events included a boat cruise to Liberty and Ellis Islands, two walking tours of Lower and Midtown Manhattan, the 9/11 Memorial, and a guided tour of the United Nations Headquarters. All these activities relate appropriately to the new Global Politics specification that the students are studying in year 2 of the A level Government and Politics course. The photo below is of their stop at the George Washington statue, commemorating his presidential inauguration in 1789. Despite being close to the ‘polar vortex’ of freezing temperatures that was gripping the United States at the time, the inclement weather certainly did not dampen their spirits. After all, witnessing Times Square in the grip of a blizzard was quite a sight! Their guide on the walking tours and the British Airways cabin crew were greatly impressed with the courtesy and thoughtfulness of the students, who were a great credit to the College. Mr Southeran thanked Mr Roegele, Mr Perkins and Mrs Michell for their assistance and steadfast professionalism throughout the visit. They look forward to offering this opportunity to the current Year 12 students in the new academic year. is the DofE Manager at the College, said “We take students walking in the Yorkshire Dales in May, to the Lake District in July and to Snowdonia at the end of August for the final part of their walking expedition assessment.” “For students who opt to take canoeing for the expedition element we are delighted to work with an external DofE approved provider, Joy of Adventure. Some Hills Road students who left the College last summer attended a Duke of Edinburgh award ceremony at Huntingdon in January where they received their DofE Gold award. Michael Tennant, winner of the Sir Michael Marshall Lecture Competition. He gave a lecture entitled ‘Making Space a Safer Place’ – talking about the Normalisation of Deviance in engineering teams and how the Challenger disaster was a completely predictable and preventable event. This is a highly prestigious competition to have won and was open to practising/working engineers up to the age of 30, as well as to students. Congratulations also to Year 13 student Zev Cooper-Bennun who spoke on ‘Heuristics and AI - how old tech is causing a shift in engineering’ and took fourth prize overall. Well done to Michael and Zev! Marshalls were very impressed by the standard of the Hills Road entries. enthused the thousands of visitors with a variety of biological specimens, smells and arthropod quizzes and the fiendish mirror tracing challenge! Ian said “It’s a joy every year to work alongside our students at the Science Festival. Their ability to communicate biology to a hugely varied audience is so impressive and they are great ambassadors for both the College and young people. I get so many compliments from visitors and other exhibitors about our students and I tell them what a privilege it is for me to teach these students. I give them opportunities and then watch them in action!” Big Biology Day (BBD) 2019 is now being planned at college for October 5th. This will be the 8th BBD in partnership with Cambridge Science Festival, AstraZeneca and Company of Biologists. It’s a free public engagement event which attracts over 2000 visitors and 40 exhibitors with hands-on biology and careers guidance. Hills Road biology students will again be central to the success of the day! Recently three Hills Road students, Charlotte Buttercase, Ellen Chaplin and Rachel O’Sullivan, took part in Young Pharma organised by Cambridge University Department of Pharmacology. This involved four sessions getting hands-on with biological materials such as a beating heart and ileum, investigating the effects of drugs and presenting their work as a poster. Out of 16 students, Ellen was awarded the prize for best poster! Paige Yau and Charlotte Buttercase eating insects on BBC Look East’s programme! Congratulations to all Hills Road students who took part in this year’s first round of the British Biology Olympiad (BBO) competition. The BBO is open to students in post16 education studying at school or college. The competition consists of two 45-minute multiple choice papers which are taken online under supervised exam conditions. Top scoring students are offered the opportunity to attend an award ceremony in London. 9,465 students from 727 schools worldwide participated this year, and many Hills Road students have been awarded medals or certificates – very well done to all involved! Gold Medal: Rebecca Stephens Brettell, Alice Lomas, Thomas Baxter, Mariana Gee Olmedilla, Jack Chapman, Isabel Dowling, Sophie-Grace Stevenson, Ed Wheeler, Tisa Manandhar. Silver Medal: Katie Oliver, William Payne Smith, Callum Watson, Abigail Stubbs, Joseph Thornley, Ben Allouis, Neve Harvey, Jack Rajack. Bronze Medal: Clare Hole, Edward Harris, Ghazal Seidi, Alana Calne, Hannah Bullough, Alexis Lauga, Malavika Nair, Natalia Zernicka Glover, Imogen Kirkpatrick, Santiago Olusanya. Highly Commended: Xing Qing Low, Leah Njenje, Georgia Seaton, Carla Handford, Almarina Grant Sanz, Katherine Heylen, Isobel Godfrey, Aswira Tahir, Emilia Dell’Anno Ellen Chatters, Charlotte Parker, Ellen Chaplin Caitlin Bracken, Alyona Subkhankulova, Elora Graham, Elizabeth Hill, Jade Canavan, Lauren Hulme, David Thomson, Riona Datta-Savage. Commended: Chia-Hsuan Hseih, Imogen Sole, Antony Taylor, Naomi Cooper-Jones, Rachel O’Sullivan, Elina Zhukova, Roshni Dholakia, James Jesty, Roberta Schofield-Martoglio, James Desmet, Sunisa Hudson. The BBO challenges and stimulates students with an interest in biology to expand and extend their talents. It enables students to demonstrate their knowledge and to be suitably rewarded with publicly recognised certificates and medals. In addition to encouraging and rewarding pupils in their studies, the BBO is the first stage in selecting a team to represent the UK at the International Biology Olympiad (IBO). The IBO seeks to challenge by both theory and practical tests some of the top pre-university biology students in the world, with over sixty countries taking part. 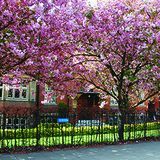 Two Year 13 students of French were invited to represent the College at the national final of the Joutes Oratoires Lycéennes, which took place on 20th March at the French Institute, Kensington, London. This national final concluded months of fierce debating competition involving hundreds of sixth form students from across seven regions in the UK. Lydia Roberts and Hannah James were accompanied by teacher of French, Isabelle Depiot and competed against teams from nine schools and colleges. Lydia and Hannah came 4th overall, which is an amazing achievement particularly as this is the first time the College has entered the competition which is dominated by private school entries. Well done Lydia and Hannah! to the College each day from neighbouring counties as there is not a centre near them offering German.” “These students made video diaries of their journeys to and from school and were also filmed in a lesson discussing the German film Good Bye, Lenin! The four students, Missey Stephens, Isabelle Yung, Oscar Hedge and Rebecca Biggin were also given a tour of the local BBC studios by reporter Georgie Bevan as a thank you for their efforts.” Watch the students’ video diaries: www.bbc.co.uk/news/av/uk-englandcambridgeshire-47379938/why-i-travel-milesto-study-german The filming coincided with a ‘Careers in Languages’ event organised by the languages team. They invited ten people, who studied languages at university, to come into College to talk to students about how speaking another language or languages has helped them with their careers and life skills. The speakers included an Italian academic, a Japanese cultural attaché, a legal translator as well as a tour guide, a teacher, scientists and professionals using their languages for business purposes. A large number of students attended the event and found it extremely inspirational to be able to hear about such a range of diverse experiences and careers that had been made possible thanks to languages. Special Thanks and Gifts from the Embassy Work Exchange of the Federal Republic of Germany Visit to Hamburg Following the appearance of Hills Road students of German on the BBC Look East programme, about the decline in Modern Language teaching in schools, the Ambassador of the Federal Republic of Germany in London wrote to the Principal and the students to express his thanks for the commitment shown by them to studying German. Ambassador Peter Wittig also sent the students a parcel of gifts containing German mementoes including books, notepads, fountain pens and umbrellas. The College is hoping that the Ambassador will accept the Principal’s invitation to visit the College to speak to Modern Languages students very soon! Students of German recently went on a work exchange visit to Hamburg. Here is Oscar’s story: For my work experience in Hamburg, I worked at Zeigermann Audio, which is a small firm that produces the sound for films, commercials and concerts. They also work in the sales of recording and technical devices, alongside other recording firms in Europe. Every day, I took the train and underground to Zeigermann Audio, as its base is located in the centre of Hamburg. During my time there, my colleagues ensured that I tried a variety of new things, which meant I also learnt a lot of new German vocabulary, such as Aufnahme (recording) and Tongeräte (devices for sound). Some days, I stayed in the building and worked in different departments which ranged from working on the sound for small films in the studios, repairing recording kit to editing and taking photos for their sales website. However, on one of the days I was asked by the manager of the firm, Herr Zeigermann, to accompany him to the recording of a national German commercial for a mechanic company called ATU. It was in a studio in the suburbs of Hamburg, and the setting was in a large hall that is often hired out to shoot German commercials. This was a very interesting experience as I got a real insight into the world of commercial filming and studio life. Whilst working in my placement in Hamburg, I got a real feel for the German workplace and the sort of aspects involved within the technical and recording industries. One of Zeigermann Audio’s aspects that made me feel very welcome was the fact that we all cooked together at lunch. I went and bought all of the ingredients and then we all cooked a meal, sat down and ate all together. The atmosphere felt very communal and sharing because of this. Working in Hamburg has also made me more determined to live and work in Germany, as over time, it felt completely normal for me to get up each day and go to work and speak German. On 19th March Hills Road Alumnus Daniel Moss came along to the College to talk about the Year in Industry placement he is currently doing. Since leaving Hills Road last summer Daniel has been working for 42 Technology in St Ives, Cambridgeshire. The Year in Industry scheme is a 10-12 month paid placement with a STEM based company for pre-university and undergraduate students run by the Engineering Development Trust. Through the year students work alongside real engineers, scientists and software developers to do real work for the company. The company is expected to develop the students and opportunities are given for them to attend workshops and master classes run by professionals in the industry. Daniel has a place to study Mechanical Engineering at university this September. Following his talk, Daniel answered questions from students about the scheme, his engineering work and his university application. code in the fastest time possible. Zadok said “I applied to this competition because it used my software programming skills and I have always enjoyed solving complex mathematical problems.” Winning the competition involved writing software that is capable of analysing the encoded message as well as automating the tasks involved in decrypting the message. The final stages involved patience and creativity in solving multiple complex ciphers. Zadok is currently studying Maths, Physics and Chemistry at A Level and next year he will be going to university to study Computer Science. Well done Zadok! • Destination planning • Law: have you considered the apprenticeship route to becoming a solicitor? • NHS Paramedic Practice and Operating Department Practice • Finance and Accounting Opportunities for curious minds by Deloitte • Interested in Geography and Environmental work? Fully paid degrees by IceBlue Brunel Uni. Hundreds of students at the College took the opportunity to explore a whole range of careers and post-18 options during this week, with much interest being shown in the new degree apprenticeship opportunities. Former Hills Road student, Laura Robinson, recently returned to the College to talk to students about her career path to becoming a top Barrister in London’s Inner Temple. Laura studied Natural Sciences at the University of Durham before going on to study at the College of Law in Guildford. Today Laura specialises in all aspects of employment law, but specifically discrimination, whistleblowing, unfair dismissal, TUPE and breach of contract. Thank you to Laura for offering such valuable career advice to students and for an extremely interesting insight into the life of a barrister. Dr Catriona Davidson, a former Hills Road student, who now works in Hepatology at Addenbrooke’s Hospital came back to the College to talk to members of the College’s Medical Society. Dr Davidson gave a presentation entitled ‘So You Want To Be A Doctor’ and talked about her career journey in medicine. The talk was well attended by students. World Book Day is not just about dressing up as your favourite book character (although that would have been wonderful to see) but about the value and joy of reading. The focus this year was on empowering young people to talk passionately and confidently about the books that inspire them. The campaign was entitled ‘Reading is Power’. The ‘Reading is Power’ manifesto, written by and for young people, is a rallying call to inspire the young activists, artists, entrepreneurs and big thinkers of tomorrow to empower themselves through books. It looks to the growing awareness young adults have of the ways in which they feel disempowered, and says: read, get powerful. WBD was marked in the Hills Road Library with a week of reading suggestions based around the Manifesto’s key themes of Growth, Choice, Power and Knowledge. Interpreting the different possibilities those themes suggested, library staff chose different books to display each day, and encouraged students to take some time out, take a seat on the sofas and enjoy choosing something new to read. We would love our students to continue this idea by sharing their opinions about the books that have inspired them, or they have simply enjoyed, by leaving a review on the Library Catalogue. Find out more in the Library, tweet us @HillsRdLibrary and next year maybe dress up too! Following Will Wisson-Burton’s extremely successful build of a life-size model of the skeleton of an Allosaurus Fragilis for his EPQ last year, he has gifted a smaller model of a velociraptor to the College. Students were invited to ‘name the Velociraptor’! There were nine entries in total and the senior management team decided that Miro Heydtmann’s entry of ‘Roary’ was the most apt name. Miro was awarded a £20 Amazon voucher. Talks were organised at the College by different departments to celebrate International Women’s Day on Friday 8th March. Dolly Theis, co-director of the 50:50 Campaign and #AskHertoStand, gave a talk to students and staff on increasing female representation in Parliament. The College’s Feminist Society hosted a talk by tutor Sam Russo on ‘Women in Punk’. The interactive talk explored the history, ideals and key female figures of the subculture that changed everything. Women who define and defy convention, and music that rips, destroys and rebuilds. The College library put together a fantastic display of books to support the celebration. Further goals for the #WomenEd community focus on improving the opportunities for women to develop as leaders in the ways that best support them, including better flexible working practices, improved approaches to parental leave and reducing the gender pay gap so that women are valued properly for the brilliant successes they achieve. Here at Hills Road SFC, two of our female senior managers have been on the ‘Making the Leap’ course, supported by #WomenEd exploring the transition from senior leader to Principal and our Principal, Jo Trump, mentors female education leaders supporting them on their leadership journeys. As a College, we were glad to be celebrating International Women’s Day and reminding our staff and students that women can be anything they want to be: opportunity is everything! Year 12 Hills Road student Sanjeet Chatterjee has built his very own personal robot assistant! Sanjeet’s debut Pi project is R3-14, aptly named due to the use of a Raspberry Pi. Sanjeet has integrated Google Assistant, which responds to spoken queries and forms the backbone of R3-14. He developed a python library, SiriControl, to allow Siri voice commands to be linked to customised actions. Another feature is a 433MHz RF control, which gives R3-14 the ability to turn lights and home appliances on and off with voice commands through either Siri or Google Assistant. R3-14’s head and on-board camera has automatic face tracking, but can also be controlled through a customised web app. Sanjeet wanted to create an interactive as well as a human-like and friendly looking robot. He has given R3-14 ‘eyes’ by including fading RGB LEDs, which respond to voice interaction. Sanjeet originally modelled various designs for his robot after which he progressed to building an aluminium prototype before using 3D-printed PLA parts to create the finished product. He said “Of all the various features, SiriControl is my favourite as I developed it myself, and I was thrilled to open it up for other makers to use in the wider community. I can ask Siri to control my devices from anywhere in the world!” More details about R3-14 can be found on YouTube: https://m. youtube.com/watch?v=_3hIpV6HPU0 and on Sanjeet’s blog:https://bit.ly/2TvcZdM. Well done Sanjeet! Spring Chamber Concert The College is extremely fortunate to have so much excellent musical talent! The Spring Chamber Concert on Thursday 21st March was another wonderful evening of performances ranging from large choirs to soloists and small ensembles, several of which have come together here at College to create great music. The concert programme included a rousing jazz choir, opening with a piece by Michael Bublé and wound its way through piano and trumpet soloists, a haunting rendition of Sondheim’s Send in the Clowns and a memorable duet for two harps. The Chamber Choir opened the second half with music-making of an equally high standard and the level of excellence continued with a range of great performers, including singers, string quartets and finished with the fabulous brass quintet playing Don’t Stop Me Now. The performers were amazing! New Senior Staff Appointment The College is delighted to announce that the successful candidate for the permanent post of Assistant Principal, Student Services and Support, is Rebecca Sharp. Becky, as she likes to be known, will relocate from London to Cambridge to take up this new permanent post in readiness for the start of the autumn term. Becky is currently Assistant Principal, Student Services at Woodhouse Sixth Form College in London, having formerly been at Lowestoft Sixth Form College, The Sixth Form College, Farnborough and, in the very early part of her career, at Long Road Sixth Form College. Originally a teacher of A level law, Becky brings with her a wealth of experience both as an A level teacher and as a senior leader in outstanding Sixth Form Colleges. It is a sector that she knows and understands well and she already has ideas of what more she’d like to bring to the College to deliver exceptional support for students. Becky was delighted to accept the role in February and she is very much looking forward to getting to know everyone at the College and continuing to deliver outstanding support and guidance for Hills Road students. Myles Johnson on keyboard, Patrick Safford tenor sax (l), Simon Herberholz tenor sax (r), James McLeish on drums and Kieran Stakem on guitar. The men’s second boat crews, many of whom only learned to row within the past year, put in an equally respectable performance with a time of 19:35. This was undoubtedly the most prepared 2nd crew the College has sent to the tideway and possibly the best 2nd men’s crew we have ever had. The performances of all the crews are a testament to the increased level of training, commitment and motivation shown by every member of the rowing team this year and special thanks to members of the Cantabrigian Rowing Club who give up their time to coach the students. 1st boat: Robert Steyn, Phil Sosnin, Jeremy Austin, Jed Beynon, Ethan Collier, Joshua Pearson, Sam Askew, Laurence Beauregard One of the Hills Road quad crew in action on the Cox: Emily Staplehurst. River Cam 2nd boat: Bertie Wilkinson, George Lawn, Alex In February, Hills Road students Hunjan, Joel Newsam, Borisz Kantor, Maxim rowing for Cantabs (Cantabrigian Rowing Braunschweiler, Joe Comyn, JP Levick. Club) increased their lead in the second leg Cox: Anthony Austin of the Winter League in the four events they Photo: Guy Beauchamp Photo: Guy Beauchamp have entered. The Winter League is a local event run by the Cambridgeshire Rowing Association for clubs from Cambridge and other towns in the county including Ely, St Neots and Huntingdon. It covers three separate races in January, February and March and the times of each of the crews are added together to determine the winners. The Hills Road Men’s first eight had a strong row in the headwind improving their overall position to sixth fastest and increasing their lead in the club B event. The second eight also improved their position in novice eights and the first quad now lead junior quads by over a minute. The biggest improvers however The women’s 1st boat crew in action at the were the second quad who were 18 seconds The men’s 1st boat crew with cox Emily SHORR on the River Thames quicker on a day when results were on Photo: Guy Beauchamp average 25 seconds slower, an excellent result that reflects the extra training they have put in since the last race. Coach Andy Johnson acknowledged the work put in by coach Nick Sirager with the 2nd eight and quad. He said “It was very pleasing to see improvement across the The men’s 2nd boat crew in action at the SHORR on the River Thames whole squad.” The women’s first boat came making it a really valuable experience for 1st eight: Robert Steyn, Phil Sosnin, Jeremy them. They were one of only four girls’ second Austin, Jed Beynon, Joshua Pearson, Sam seventh in the 1st 8+ category, the best result 8+s to race, meaning that they had to race in by far for Hills Road in recent years. It is the Askew, Ethan Collier, Laurence Beauregard. 2nd eight: Bertie Wilkinson, Joe Comyn, first time in at least five years that a Hills Road the School 1st 8+ category. They placed 18th, Sonny Osman, Luke Vanderstay, Matt Melloy, Women’s crew has placed in the top ten at an excellent result in a competitive category. Will Crawford, Borisz Kantor, Emanuel this event. The crew was able to adapt their Their cox Emily Walker, a Hills Road rower, Merhan. did a fantastic job, especially given the tough rowing to the conditions really successfully, Anthony Austin coxed both eights allowing them to overtake a Headington crew weather conditions. 1st quad: Robert Steyn, Jeremy Austin, Jed and push off the Emanuel School boat that 1st boat: Freya Sutcliffe, Lorna McBride, Beynon, Phil Sosnin. was chasing them. Cox Charlotte Parr (a J14 Katie Oliver, Jessie Hassett, Zara Parr, Mia 2nd quad: Bertie Wilkinson, George Lawn, rower), did amazingly well, really rising to the Beauchamp, Amy Hill, Lucy Jennion. Alex Hunjan, JP Levick. Cox: Charlotte Parr. challenge of coxing on the Thames for the very first time! 2nd boat: Cass Baumberg, Catherine Morley, Emma Stephens, Sirena Neaves, Michelle The women’s second crew also raced very well; for most of the girls in the Santos, Ruby Page, Ghazal Seidi, Eva James. boat it was their first time on the Tideway, Cox: Emily Walker. The College entered five Hills Road boat crews (Cantabrigian Rowing Club) in the Schools Head of the River Race on the River Thames on 15th March. The men’s rowing team entered three full eights into the race, an indication of the depth of the team and the strength of the crews this year. Unfortunately, difficult conditions led to many of the categories being cut from the race due to safety reasons, so our third boat was unable to race. However, this did not stop the 1st and 2nd 8 going out and delivering solid performances. The men’s first boat put in a strong row with a time of 18:21, the fastest time of any Hills Road boat at this race in five years. The crew successfully fought off the crews chasing them, beating the two crews behind them by a margin of 40+ seconds. This time placed them 14th in the School 1st 8 category and 55th overall. Sporting Successes: Noah Aldous In November Noah won a silver medal at the Eastern Area British Schools Judo Championship representing Hills Road Sixth Form College. This medal gave Noah a priority entry to the National Schools competition. The British Schools National Judo Championship 2019 took place during the weekend of 16th and 17th March at the English Institute Of Sport in Sheffield. Once again, Noah represented Hills Road where he competed in the Year 12 and 13 group. Cross Country Runners Represent Cambs After winning the Anglia Schools’ Cross Country Senior Girls race in February, Year 12 student Shannon Lockhart was selected to represent Cambridgeshire Schools at the English Schools Cross Country Championships in Leeds on 16th March. Also selected were Year 12 students Nic Harhalakis and Conall McGinness and Year 13 student Thomas Keen. The ESAA National Cross Country Championship is the most eagerly anticipated event of the winter for young athletes. Organised entirely by volunteer teachers, they bring together the best athletes in each of the 46 counties in England to compete for the honour of being the best in the country. Shannon came 4th in the Senior Girls - Foyston Trophy category with a time of 15:14. Thomas Keen came 9th in the Senior Boys Derbyshire Trophy. Well done to all students who took part. An outstanding win for Hills Road student and junior sculler Jeremy Austin was achieved at the first ever Head of the East competition. The competition is run by the Eastern Region Rowing Council and took place on 3rd March over a course of 2.2k at St Neots. Jeremy was competing in his first ever race in a single scull and not only won the junior event but was also the fastest overall sculler by 1 second in a time of 8min 51 seconds. Coach Andy Johnson said “It was a very good result particularly for a first race in challenging strong crosswind conditions.” Well done Jeremy. Jeremy Austin in action at St Neots Production Notes Articles and photographs for this edition of the HillsNews were produced by Kathy Ashby, Guy Beauchamp, Amélie Bowers, Vivien Brownlee, Sanjeet Chatterjee, Becky Clark, Isabelle Depiot, Dolores Gutierrez, Ginny Hales, Ian Harvey, Oscar Hedge, Andy Johnson, Lorna McBride, Adrian Medd, Josh Perkins, Katrina Perrin, Jill Phelps, Francine Rigoni, Flora Sharp, Philip Sosnin, Chris Southeran, Shelley Tenberg, Jo Trump. team to play in the Nationals in Nottingham. This year five Hills Road students and three from Long Road will again go to the Nationals in April to represent the East region. Few colleges in the region have enough players and it has been difficult to arrange fixtures. Hence lots of Hills Road students have been playing for ‘Barbarians’ teams against Cambridge University and Anglia Ruskin University development teams. Joint training sessions on the illuminated pitches at Shelford have proven popular and helpful to develop the skill levels of the students. Hopefully an intake of new players for the 2019/2020 season will further strengthen the group who now know what a great game it is to be involved in.